2/06/2007 — Acquisitions — Ecouen, Musée national de la Renaissance and Paris, Musée du Louvre — Two XVIthC. French paintings were acquired by the Musée national de la Renaissance in Ecouen (France) and by the Louvre in Paris only a few months apart. Although painted at different times, they are both anonymous and influenced by the work of Italian artists who lived in France. These acquisitions prove the renewed interest of museums in French painting of the period. The panel purchased by Ecouen (ill. 1) from the Richard Pardo Gallery in Paris, can be dated at around 1550. It is undoubtedly the work of an artist close to Luca Penni for its stylistic characteristics, its sculptural, angular and massive, aspects, found in a painting such as Venus caressée par l’Amour at the Musée du Berry in Bourges, France . Thierry Crépin-Leblond, the Director of the Musée de la Renaissance, mentions the name of Geoffroy Dumonstier as a possible lead in identifying the artist. 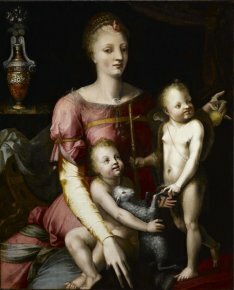 According to Guillaume Kazerouni, one cannot place it as belonging to the Fontainebleau school, since the panel was probably painted in Paris. 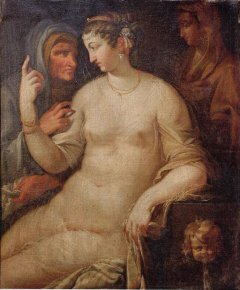 The Musée du Louvre preempted the sale of a painting of the second Fontainebleau school, representing Vertumna and Pomona for 76,000 E (before commission) in Lyon on May 13, 2007 (S.V.V. Anaf) (ill. 2). In excellent condition, the work remains anonymous. According to Sylvie Béguin, it is directly influenced by Primaticcio and, particularly, by Nicolo dell’Abate, perhaps from a cartoon. It recalls closely the figures of semi-reclining women in the Galerie d’Ulysse and the Salle de Bal and can be compared to a Nicolo drawing held in Münich (Staatlichen Graphischen Sammlung), La Procureuse  Guillaume Kazerouni also pointed out to us a strong Nicolo influence, but considers it to be an original composition. Both agree in dating it at the very end of the XVIthC., even beginning of the XVIIthC., and in emphasizing its great interest and extreme rarity. The painting could also belong to the very early work of a French artist of the XVIIthC. strongly influenced by Fontainebleau. At the auction, the work was presented as belonging to the circle of Toussaint Dubreuil. The painting in Bourges, after its listing as anonymous in the catalog to the exhibit L’Ecole de Fontainebleau (p. 210, cat. 236 ; see following note) has since been attributed to Luca Penni. This association was suggested to us by Guillaume Kazerouni. Catalog to the exhibit L’Ecole de Fontainebleau, Edition des Musées Nationaux, Paris, 1972, p. 17, cat. 15.